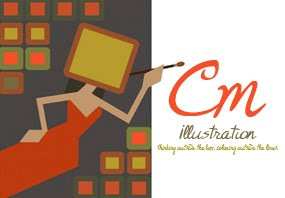 Hi everybody and welcome to Courtney Mason Illustration! My goal is to translate written and verbal ideas into visual imagery that is colorful, compelling, and clearly communicate the objectives of the client. I pride myself on my versatility and am confident in my abilities to tackle any challenge both effectively and efficiently. I am open to creative opportunities in a variety of markets such as but not limited to Graphic Design, Advertising, Editorial, Book Publishing, and especially Post Production for Entertainment. My "dream job" is to someday have a career within the animation industry. The holy trio or trifecta of skills will be in character design, storyboarding, and character animation. I have experience in experimental animation, stop motion, claymation, 2D and 3D animation using Autodesk Maya, Photoshop, and Final Cut Pro. In 2011, I received a grant from the Women's Education and Leadership Fund to conduct a study of animation through research and practical application. I learned the fundamentals and foundations of 3D animation through the Ianimate Advanced Character Animation Program and I am continuing my education through Animation Mentor School for Character Animation online starting this upcoming fall 2012. I am very much a team player, but also a self starter and driven towards success. Since I was a child, I was an entrepreneur, a quality I believe I enherited from my father. This sense of leadership and drive has always helped me optimize every opportunity and has given me confidence in the value of my ideas. While I am very dedicated to clients needs before my own needs, I always feel like I have something to learn and something to give. So a lot has happened since my last post. I'll try to summarize it so your not falling asleep over there. January 2013 = all time low. unemployed and animation mentor drop out. why you ask? well, I decided that maya animation while fascinating to try and master was not my true passion. Animation is yes, but I am 1000 x happier drawing than working in Maya...fact. So I was back to the drawing board and for a brief time had a job that equivocated to working at hooters...as I said. all time low. March 2013 = landed a summer job working @ yale at a summer program for the arts and technology...but what to do in the meantime...well, through my good old craigslist searches I found and landed a job working at a publishing company in Princeton that specialized in year books. I learned a lot, got promoted within a month to a management position. I learned quickly and worked hard. Downsides were the hours, the commute, the pay, and the lack of creative work. Perks were pizza for overtime, paid overtime, a beer machine next to a coffee machine, the young atmosphere, and the experience of working in publishing. That and I played laser tag with everybody at our production season kick off event. While I was hoping they would offer me full time employment in the creative department after a while I realized I needed something else. More creative than yearbooks. June 2013 = Sure enough, I got scouted by a creative recruiter from NYC (thanks onward search) and hooked up with a job in my area and in a pharma based marketing branch. Initially they interviewed me for a position that was 3-6 months in length as a studio artist building e-books and interactive media. They ended up not hiring me for that because my lack of experience in it...*though I bet if they knew then I'd be doing that now they would of kept me around longer* They wanted to to help them edit and revamp an updated campaign for a drug, so I did that instead. I had to milk it because the edits were so fast and I was almost two efficient. Had I not been given a temp position, I woulda gotten it done in two to three days. I made it drag on for two weeks so I at least got a decent pay check and got to learn some more. It was only a few weeks till my Yale job any who, so it was good to keep busy. The pay was AMAZING, the work was effortless, but still, I yearned for a challenge. June 2013-August 2013 = ask me how I ended up an assistant director/ health and safety coordinator I have no idea...but more or less I was a nurse and another set of eyes. A den mother of sorts, making sure the kids were having fun and safe. I got to go on all the field trips to NYC and the Museum of the Moving image, and seeing kids half my age doing what I wanted to do for a living was enough motivation for me. The perks of this job was, it was 90% down time, I just had to be on call, so I had a lot of time to search for jobs, and do mock ups to get interviews. I also tried to pick up any fun tips from my co-workers who were all very versed in media and apps. The kids were for the most part very well behaved, some with some really serious medical issues, but I felt kinda cool that I was able to be maternal. wooh! January 2013 = all time high, not only am I still loving my company, I have made some good impressions I believe. Our main client loved the design of my game, another prospective client we landed because of an interactive animated parable I created, and now I am working on some really exciting projects in addition I have been taking classes at the good old Society of Illustrators and continue to my develop my work. :) I now reside in manhattan and love everything about it (minus cost of living). But its worth it. moral of the story: hi. my name is courtney. and I will continue to be an artist no matter what all time lows I hit, I will keep trying. And everybody else should too. yes, not only is it the term for an animator, but it also serves a perfect double entendre. You see, I feel like I am an in-betweener in more ways than one. Right now, I am in-between jobs, in-between passions, in between...a rock and a hard place. The rock is, that I just started school for animation and I am just grazing the surface of what it means to animate and entering that world. Meanwhile, I'm getting plenty of offers to illustrate, but for unfair pay or royalties only, which is virtually nothing. I wish I could teach or do a job that I can be creative in that doesn't distract from my current focus of animation/illustration. I'm working on finding a way there. So, in the meantime...I shall keep on pushing from the in-between, to the break down, and than finally my x-treme new life :) how's that for some creative metaphors! Here are some pictures from the big show! This was my first time where I actually had some fans that weren't just friends and family! A few people recognized me from the last show which was exciting! Even though I didn't get selected to move on to nationals, another HAS alumni did and I am happy for her! I started to unwind by the end of the night and my caricature booth blew up...I had a line of over twenty people waiting for me to draw them. I timed myself and could start and finish a black and white drawing of more than one person under 10 minutes. I have never done this before so it really challenged my speed and skill. 1.) I was nominated for the state semi-finals for RAW's Artist of the Year award, the biggest indie art competition in the world. Artists were narrowed down from 100 other eligible participants based upon an online voting and a panel of RAW judges. I also must congratulate my other Hartford Art School Alumni for also making it to the state semi-finals. I would be thrilled if any one of us are voted to continue on to nationals. I am permitted to hang only 5 pieces and I am going to make sure that a majority of the work is new and better than before. I really think I have a shot at this, so I am going to put all my energy into this. Everybody that attends gets one sticker per category. You are permitted one vote for each category (performing arts, visual arts, photography...) 50% of public live vote and 50% judges discretion is what will determine who wins in each category. and may the odds ever be in your favor. ALSO, I am half way through my animation course I. Trying to step up my a game for that. I have two children's book contracts I am drafting up as well. Cheers to feeling like myself again and making art everyday! Maybe I am being naive, but I do believe that at this tender age of 23 I should keep dream chasing. But the work I was doing combined with school, combined with trying to create new art, was slowing me up in all aspects of my life. So after much thought, I gave my two weeks notice and graciously resigned. I realize some might criticize me for this saying I should be grateful as an artist to have found any employment at all or that I at least should have found a better job first before leaving. However, I value my creativity a little more than some people do...and I am willing to put in the time and live a frugal lifestyle until someone truly recognizes it and appreciates it. And that may happen sooner than I think. I am not sure. I had two interviews since I departed on Friday. While of course I hope they work out, I wouldn't mind doing freelance and really boosting my portfolio for specific markets. I feel like while my college education offered me versatility, but it didn't offer me much time to hone in on a specific market. So, I am going to have to do this myself. Courtney Mason © All Rights Reserved. Awesome Inc. theme. Powered by Blogger.